If the lifting points are an equal distance from the center of gravity Adjustable Bridle can be hooked up with the double or single sling on either lifting point. 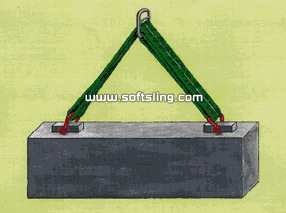 If the lifting points are an equal distance on either side of the center of gravity but one is higher, then the double sling should be attached to the higher lifting point. 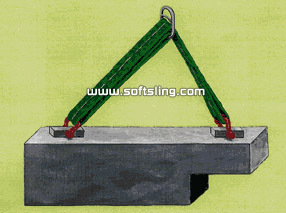 If one of the lifting points is closer to the center of gravity, then attach the double sling to this lifting point. 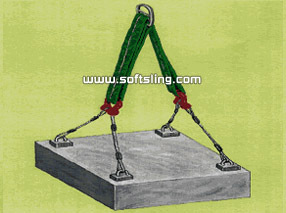 It will have the highest weight concentration.If the Adjustable Bridle is attached so that the single sling is nearest the center of gravity, it will not allow the lift to be made. Never use the Adjustable Bridle in situations where the sling-to-hook angle is greater than 45 ํ Always connect above the center of gravity. 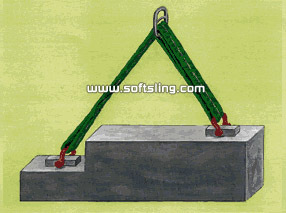 If connections are made below the center of gravity, then the load may turn when lifted.